Portumna Golf Club is just a 10 minute drive from Fuchsia Lane Farm cottages and offers a beautiful woodland setting for anyone interested in ‘going on a course’ while holidaying in the area! 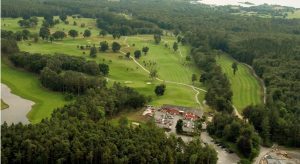 The club, founded back in 1913, is situated within Portumna Forest Park and offers some wonderful scenery, whatever the time of year. A mature and graceful forest provides a backdrop for a challenging experience, no matter what time of the year it is played. Laid out over undulating land, the course has lots of interesting shots, including a number of elevated tee-box positions. €20 per person Tue, Wed Thurs and Fri.
€25 per person Sat and Sun and a special discounted rate of €15 applies to those available to play on Mondays on the weekly Open Day. The Fairways Restaurant is also open to visitors and a great place to have lunch. Here at Fuchsia Lane Farm we can assist you by purchasing green fees for you in advance and helping to make your time as enjoyable as possible. If you are planning a golfing break with a few friends our Lime Kiln cottage or Lodge Cottage provides the best accommodation option for groups of 4.